The Alpha Course is a ten-week course that covers the major concepts of the Christian faith in a fun, casual setting where it is safe to ask anything. No question is ever too simple or too difficult. The course is ideal for those who are new to Trinity, especially for those who are new to Christianity, have been away from church for a while or want to get a good grasp on the heart of the Christian faith. Alpha gives everyone the opportunity to explore the meaning of life in a relaxed, friendly setting. The course meets once a week for 10 weeks, including a one-day or weekend getaway. Sessions begin with a meal, followed by a short talk and time to discuss what’s been taught. care, education, discipleship, and evangelism. Additionally, John is the minister of Alpha course. at Dankook University, South Korea in 2001. 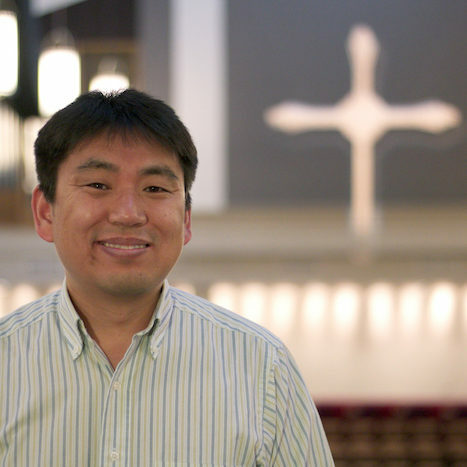 He moved to the United States in 2005 to begin seminary. He studied for Master of Divinity in Southwestern Baptist Theological Seminary in Fort Worth, TX for 3 years and transferred to Brite Divinity School at TCU. John completed his Master of Divinity at Brite in fall, 2011. He is an ordained elder with the Central Texas Conference of the United Methodist Church. I'm already a Christian. What will Alpha do for me? Alpha will help you define your faith walk with Christ and give you direction on how to serve Him and others. It also helps to develop relationships with others at Trinity. It is important to try to attend each session, but the Team can work with you to stay current. A little bit of Alpha is better than none at all! There is no cost to the guests to attend Alpha at Trinity. We want you to be comfortable, so casual dress is ok. At Trinity, it is more important that you are here, not what you are wearing. Alpha means just that to me, the beginning. A great opportunity to find something I thought was lost on this earth; God's Holy Spirit. It took me 10 years to find Him among other believers, but I'm to blame for most of those lost years. I was saved at 7 years of age, taught that prayer was the most important thing I could do to get help from God. I claimed that right as a Christian for many years. God never really let me down, although He spanked me when I needed it spiritually. He led me through valleys onto mountain tops, only to face the next valley just down the hill. Sometimes I just sat there and said Lord, please....no more walking. Then He would carry me and I would long to know why. Why Lord, do you persist? Then in 2006, Alpha brought it into focus. It did for me what I've always wanted more of, a deeper relationship with God among a family of spiritually driven believers. As a Christian without a home, Alpha led me into God's dwelling place for a richer, more meaningful experience with The Holy Spirit. I felt welcomed by those who served in this ministry. Each passing week made me feel closer to God and my prayer time expanded from just the morning wake to include noon, and night. Now I want to talk with God, not just need to! Alpha gave me the insight into what God really wanted between He and I...a deeper, more meaningful relationship. Now I have many great friends that helped me get there, and I would like for you to meet them! I did not grow up in the church per se, but was baptized as a teenager in the Baptist church. Through my young adult years I lived outside a personal relationship with Christ, but I always knew God was out there calling my name. God used every trial and struggle over the years to mold me, teach me who He was and that Jesus Christ loved me beyond measure. I was 33 years old when Jesus Christ truly introduced Himself to me for the first time. It wasn't even in a church, but in a small Bible study at work where a very diverse group of people met once a week to study the Bible. My heart was finally ready for that personal relationship with Jesus. In an instant the eyes of my understanding were opened to the Truth. Still, more of life's disappointments and tragedies came to rock my faith, and for a time I turned my back on my faith in God and the church. The Lord's "No" can be devastating at times, especially when it means a loved one is taken from you. Out of anger and bitterness, I chose to walk through a dark valley for several years, but God was still there. The Lord My Shepherd never left me. His rod continued to prod me in my wanderings and His staff continued to rescue me from places where I had gotten lost. It took a great deal of brokenness, but I finally returned to God with a broken and contrite heart. Next to His still quiet Waters, He brought gentle healing and restoration to my soul. Joy and gladness, He brought back into my life through my wonderful family and special friends. I first heard of ALPHA through my mother when she invited me to her first Celebration Supper. It had changed her; as it brought joy to her life. She invited me to attend several times, as she completed a second session. I thought it was wonderful how ALPHA had changed lives and brought people together, but I still didn't feel called to participate. It was my boyfriend that was truly moved by Nicky's video at the ALPHA Introductory Supper, as he felt strongly that we should attend. I was willing to go along for him, but I had no real expectations. But guess who was there waiting for me? Yes, God was there. He knew what was around the next bend, plus He knew I would come to need the people of ALPHA. Every week they were genuinely friendly and welcoming. Thursdays became something I looked forward to, with the fellowship over dinner, the lessons from Nicky, and the great small group discussions. And each week God was there to remind me how He had always been there in my life and to trust Him, no matter what life brings. Midway into my ALPHA journey, I found myself facing the spirit of darkness – excessive drug use on a Saturday night left my 18 year old son out of his mind. My mother and I stood vigil all night and God was there to assist us. Then the Holy Spirit Day Away came the following weekend, and it was a wonderful opportunity to once again testify to God's greatness and mercy. Only two weeks later, this same son was in a near-fatal car accident. God was definitely there, too, miraculously sparing my son's life and restoring him - mind, body and spirit. He still is! Without a church home in times like these most people flounder and drown in the down-ward spiral of circumstances, but God had placed me in a "foster home" when He placed me in ALPHA. The prayers and heartfelt concern was a wonderful comfort in this time of trouble. I realized that the course had carried me to a deeper understanding of Jesus Christ and His call upon my life. It was through ALPHA that I learned the true importance of being in the Body of Christ and being committed to serve and support others. So I soon joined the Trinity United Methodist Church family along with my boyfriend, soon followed by our other personal friends. I believe in the ministry of ALPHA and as long as the Lord allows, I will continue to participate and help with this blessed program. Even if you think ALPHA is not for you, come. Come without expectations. Just come, because God is there. Come on in, the Water is just right! At various times in my life, I had gone to church, but never with much conviction. As a child, I would go to Sunday school with my brother. Afterwards, we would attend the morning service with my mom. I don't remember God or faith being all that important; I just had to go. By the time I was in 3rd or 4th grade, my family had stopped attending. that a lot of what people said in the church differed what they did outside the church. We continued to attend sporadically, but following the birth of our 2nd son, we stopped going completely. Up to this point in my life, I thought I was doing great; great wife, great kids, great job, great home. Still, something was missing. It was like that dream you can't remember when you wake up; you can't put your finger on it, you can't even describe it. But I did try to compensate for it; I began buying stuff. When this didn't work, I poured myself into my job and various projects around the house, anything to keep busy. I was sure if I worked hard enough and long enough, I could figure it out. Well, seven years passed and I was still trying to figure it out, and I was burned out. About this same time, a friend of my wife invited us to an Alpha class. I went not expecting much, but everyone was very welcoming and I could feel something different about it. I found I had questions I wanted answered and so each week I would bring a list to our small group table. As we discussed everything, I sensed the weight starting to lift off of me. I had come to Alpha expecting the same old religion I remembered from my youth; a God I felt was not relevant to me. Instead, at that small table I found grace and a sense God genuinely loves me. It's been almost three years since I attended the Alpha class. My wife and I are active members of church...and I've never been so blessed. I started my spiritual life as a Lutheran. I was baptized and raised Lutheran. The summer going from fifth grade to sixth grade my sister and I moved to Chicago to live with our father. After a year my father decided that we would become Catholics. Two years of study with a priest, re-baptized and confirmed by the Bishop. We were Catholics. I tried, but I never really made the transition to Catholicism. After about a year I left the church. I was 14 years old. As life continued, despite increasing personal and professional successes I found that I had feelings of emptiness and of being alone. To quote a Peggy Lee song from the 60's "Is That All There Is?" Throughout the years I had tried many different things to eliminate these feelings, none of them were successful. Around 1990 through a neighbor and a friend, I returned to a Protestant Bible church. I was 36. I took Jesus Christ as my savior. Life continued to improve. I thought I was a Christian. The feelings of emptiness and aloneness continued. Following a divorce I found myself living in Texas. I attended a small Lutheran church in North Arlington. The people there were wonderful, kind and caring. But, I did not feel the presence of the Lord there. The feelings of emptiness and aloneness continued. A close friend invited me to attend Trinity and I became a regular visitor, later a member. I felt that I had found the presence of the Lord at Trinity. Still, the feelings of emptiness and aloneness continued. While attending Sunday School I became aware of the need to improve my Christian knowledge. I heard about the Alpha class. I did not know what it was exactly. But, it sounded like a good place to learn more about Christianity and the Lord. I began attending Alpha. I was churched, I was a Christian - or so I thought. Through Alpha I realized that I was a part of a Christian, but, not a Christian. I came to realize that I did not have a close personal relationship with the Lord Jesus Christ. During the course, I suddenly found myself speaking very articulately about my faith, I did not know where the words were coming from. Later I realized it was the Holy Spirit. Through the guidance and teachings of the Alpha course I developed a personal relationship with Jesus Christ. The life-long feelings of emptiness and being alone left me. These feelings were replaced with a sense of calm and peace. I found the Alpha course to be a very gentle yet powerful way to move towards a close and personal relationship with the Lord. In the process I met some great new friends. If you are curious, if you are seeking the meaning of your life, if you are seeking a relationship with Jesus Christ, I invite you to take a walk down the path that Alpha offers to see where it takes you. The song "Amazing Grace" summarizes my life. I wasn't always a Christian. Sure, I started out as a Christian having been christened as an infant in the Episcopal Church. When we were small, my mother dutifully took my sisters and me to church every Sunday. I turned my back on God when 13, after my mother died from complications of a long-term illness. My father started dating a woman who would end up playing a huge role in turning my life around. At the time, though, I was mad at him for "replacing" mom. I felt it was disrespectful and just plain wrong. I now realize that God placed her in my (our) life for a reason. lives. I was so arrogant and bitter towards religion. How wrong I was! I didn't think there was anything missing in my life, but I still felt that empty hole in my heart. I just attributed it to the loss of my mother. I ignored the feeling as much as possible, but it was always there, nagging me and creeping into my thoughts. I felt God's presence stirring inside of me when I had my first child. Something inside of me began to change. When I looked at my daughter, I felt she was a miracle of life. It was an amazing feeling. I still didn't consider myself a Christian, but I was on my way there. I started a new job and met a co-worker, who was a recent convert to Christianity. She was so enthusiastic about how God's love filled her entire soul. At first it was a little annoying and awkward, and I tried to keep my distance. But then I started to really warm up to her, because I thought she was really cool and hip and we had a lot in common. She was another person that God placed in my path to influence the decision to finally accept God into my heart. After a string of minor tragedies happened to my family and me within a short period of time, she made a very simple gesture of giving me a small silver cross as a source of comfort. She told me that God doesn't give you more than you can handle, that everything happens for a reason and that God would take care of us. I'd heard all of that before, but for the first time in my life, instead of rolling my eyes at her, I believed it. He did take care of us and everything worked out better than I could have imagined. In the midst of it all, I received an additional blessing through the birth of my second daughter. I started going to Trinity United Methodist Church with my step-mom. Every Sunday I looked forward to hearing what my pastor, Dr. John Robbins would say. It was like every sermon he gave was focused right on my personal problems and me. I felt such a sense of comfort at Trinity, like I had never felt before at any other church. My stepsister, who went through the Spring 2004 Alpha Class, invited me to the Celebration Supper, at the end of her course. As I listened to all the people who stood up and gave their testimonials, one woman's story really struck a chord within me. Her story was similar to mine, and I thought, "I want some of that Alpha enthusiasm that she has!" So I signed up for the Fall 2005 class. By coincidence, I think not, she ended up helping at my table! Everyone at my table was so insightful, came from completely different back-grounds, and had such different angles on Christianity. It was such an amazing learning experience for me. Thanks to friends at my Alpha table, I was able to get over several huge stumbling blocks that I was struggling with. I got so much out of the Alpha Class that I decided to give my testimonial at the Celebration Supper and again at the Spring 2006 Alpha Introductory dinner even though I was scared to death. I feel like it's the least I can do, since Alpha has done so much for me. It's my way of giving back and giving thanks to the people who helped get me to the point I'm at today. I do think that God does things for a reason and has placed many very wonderful people in my life who have lead by example and showed me the way, including all of the wonderful people at Alpha and Trinity UMC.